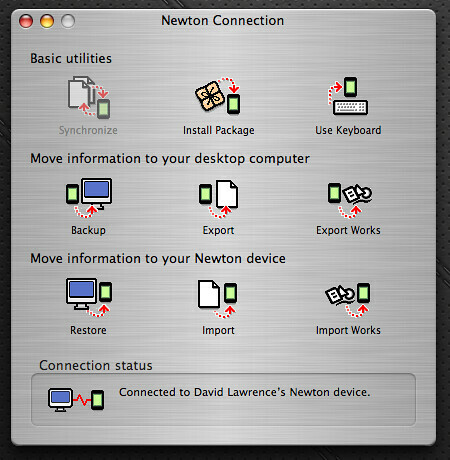 Of all the Newton connection utilities designed to sync your MessagePad or eMate with OS X, I looked forward to trying out the Newton Connection app the most. 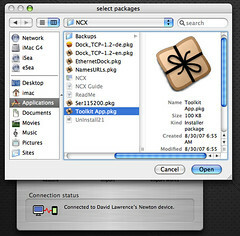 NCX is an application designed by Simon Bell to mimic the original Newton Connection Utilities functionality in the pre-OS X days. 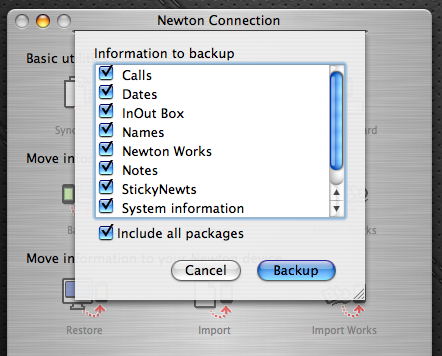 As you can see from the home screen above, it offers tons of options for your Newton data, including backup, package installation, Newton Works import and export capabilities, and Mac keyboard functionality. As with previous connection apps, you want to have a way to connect your Newton with your OS X Mac. NCX gives you the option of using Ethernet or serial-to-USB to connect. I opted for the serial option, using a Keyspan USA-28x serial-to-USB adapter. To get started, you need to download a Keyspan driver [Note: link updated] and restart your Mac. Download NCX on Simon Bell’s page, and drop the NCX folder in your Applications folder on your Mac. For this project, I’m using a Newton eMate 300 and an 800 Mhz iMac G4 running the latest install of OS X 10.4 Tiger. 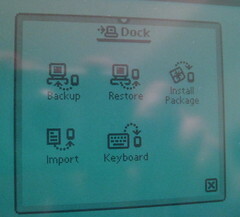 After you get everything installed, launch NCX, pick your connection method in the Preferences, and head to the Dock on your Newton. NCX waits for the connection, so the Dock will initiate the contact. Once the two connect, you can get your business done from the Newton (above) or NCX. Of all the things NCX can do, I was most excited about the screenshot function. Before I was able to try, however, NCX let me know I needed to install the Toolkit package (above). 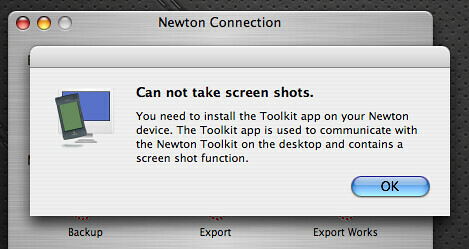 The Toolkit is itself an app on the Newton, but I opted not to find out what, exactly, it does. That can wait another day. Now, the screenshot. There is no dedicated icon on the NCX homescreen for screenshots. Instead, you head to File > Screen Shot. 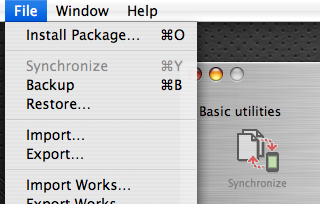 It even has its own keyboard shortcut. For my eMate, though, there would be no screenshots taken. I got the above error when I tried, which might mean either the screenshot picture file is too large for the eMate to handle, or there’s not enough RAM. Here I had really looked forward to finally taking some screenshots on my Newton. I’ll try again when either I get more memory installed, or I get a flash card to expand the Newton’s storage capabilities. Next, I tried NCX’s keyboard connection. I wasn’t impressed with the speed of Escale’s keyboard option, but this time I was blown away. 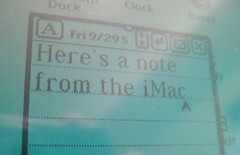 As I typed on my iMac (above), the letters appeared on my eMate’s Sticky Notes app almost immediately. At times the eMate struggled to keep up, but it was still a huge improvement over Escale’s keyboard connection speed. I liked that NCX includes a backup function, since if you store contact and appointment information on your Newton, you need a way to protect the information. With NCX, you get to pick the information you want backed up (above). If you just want, say, your calendar appointments backed up, you can deselect everything else. 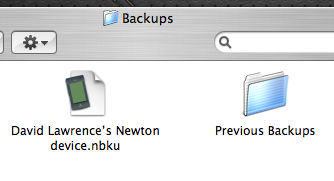 I liked the idea of backing up my eMate info inside the NCX folder, so I created a Backup folder (above) and linked NCX’s backup function to it. The backup went smoothly, and only seemed to drag when it started to sync package files. 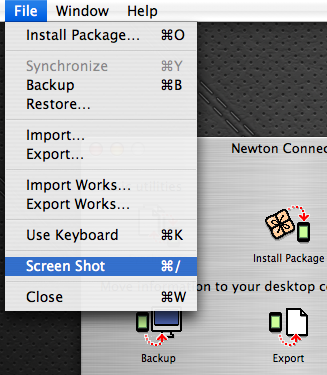 Another handy feature is the ability to import and export files between the Mac and the Newton. Here, I exported a Newton Works file from the eMate to the iMac, and it showed up as a rich text file. This is great for writers who take their Newton on the go. When they get back, they have full access to whatever they type up in Works. Going the other way – from the Mac to the Newton – was a little more complicated. NCX allows you to drag and drop files into the Newton. When I dragged a simple to-do text file onto NCX, it indeed sent the file to my eMate. I have no idea where to look for it. The one area where NCX failed me was in synchronizing my Address Book and iCal info with the Newton’s Dates and Names apps. The function was grayed out (above), even though everything else worked fine. It wasn’t until I read the Newton Connection Guide that I found the synchronization feature “is not implemented yet.” Bummer. So NCX would be perfect, if it weren’t for this glaring lack of functionality. It’s true that you can use other apps to sync your data (though Escale failed me), but it would be optimal if we Newton users had one go-to app that did everything we need. The good news is that Simon makes gradual updates to NCX. Maybe that sync feature will make it eventually. Until then, NCX is still the most capable of the Newton-to-OS X apps I’ve tried. Posted by davelawrence8 at 5:36 am on December 15th, 2008. 13 comments... » Categories: howto, newton, OS X, software. Tags: apple, eMate, how to, imac, mac, messagepad, ncu, ncx, newton, newton connection, OSX. Subscribe via RSS. It’s good to see you having success. But 2.x users will never experience the luxury synchronization of 1.x. Compared to NCK, NCU is a pain to use. Posted by Matej Horvat on December 15th, 2008. Thank you very much. This is exciting as I have just purchased an eMate for Christmas on eBay. Can’t wait for it to arrive. Posted by Michael on December 16th, 2008. @Matej – NCK sure is a lot simpler, I’ll give you that. @Michael – good luck, and have fun! What do you plan to do with your eMate? Posted by davelawrence8 on December 16th, 2008. Posted by Making the most of my iMac G3 « Newton Poetry on December 29th, 2008. I recently bought an Keyspan USA-28x serial-to-USB adapter on E-bay today it arrived by mail, I want to use it to connect my Messagepad 120 to my Macbook Pro Mac OS X 10.5.6. I cannot find the driver for the keyspan adapter, i searched the net but al links to the driver seem to be dead. Do you have a suggestion how to obtaain a driver? Posted by Leon Emmen on January 22nd, 2009. Hi Leon – I had a link in the third paragraph, but now that I try it, it’s dead. Let me do some searching and see if I can find it. Posted by davelawrence8 on January 22nd, 2009. Posted by Newton Poetry — Keyspan bought by Tripp-Lite, drivers relocated on January 26th, 2009. Posted by Newton Poetry — Keyspan adapters page found on March 8th, 2009. Posted by Newton Poetry — How to do stuff with your Newton on March 26th, 2009. Posted by Newton Poetry — Using a Newton eMate 300 as a journaling device on April 12th, 2009. Posted by Newton Poetry — Installing Y2010 Patch 73J186 on an eMate on August 10th, 2009. Posted by Greystoke on November 4th, 2009. Posted by Newton Poetry — Another voice for the MessagePad on April 26th, 2010.